Discussion in 'Comics Central' started by Ome, Oct 30, 2017. Adam West and Burt Ward reprise their roles as Batman and Robin in new animated film Batman vs. Two-Face, an affectionate recreation of the 1960s Batman TV series. With West having passed away in June of this year, Batman vs. Two-Face was widely believed to feature his final performance as the Caped Crusader. "I don't know about that," he said. "I don't know about that, but I'm not going to say any more. "All I know is I'm not allowed to talk about it. So I'm just saying factually that your statement would not necessarily be correct." Intriguing, right? Ward continued: "I don't know what they're going to do in the future. It all depends on how, from a business standard, the movie does. But I will tell you this: Warner Bros knows exactly what they're doing. "If Warner Bros decides to make another one, or more, who knows what the future holds?" Whether it marks the end of an era or not, Ward insisted that Batman vs. Two-Face – which also stars William Shatner as Harvey Dent / Two Face – is a "fantastic" effort. "What makes it so special for me is the fact that these writers, director and producer, they weren't just hired to come in and do this; these are true Bat-fans. When they were kids, growing up, they loved Batman, and you can see the love that they poured out in their creativity." It's 50 years since West and Ward originally played Batman and Robin on screen, but Ward said that when Batman ended in 1968, he knew it wouldn't be the end of his journey with the Dynamic Duo. "It was such a gigantic hit, we knew it was a classic. Both Adam and I completely understood that this would be something that could be played for generations to come. And in fact, that's exactly what's happened. Batman is still on every day in the United States in re-runs. "I go out on weekends and sign autographs to literally thousands and thousands of people – a few months ago with Adam, we were in Dallas, with 80,000 paid attendants to come see us. A few months before in Toronto, 160,000 paid attendants to come see us." As for his long relationship with West, there's not a hint of on-set feuding or bitter rivalries here – Ward has nothing but positive memories of his Bright Knight. "I was dear friends with Adam, starting 15 minutes before our screen test in July of 1965," he said. "Within five minutes of meeting, the two of us were talking and laughing, and we never stopped laughing. It was 50 years of laughing." I will tell you this: Warner Bros knows exactly what they're doing. I suppose there's no reason that they couldn't keep making Batman '66 style movies indefinitely but recasting would take away a lot of the point. The above quote from Burt Ward suggest that Warner has also given this some thought. Has the technology reached the point where voices can be reproduced electronically? I've heard about celebrities recording hours of sounds and words so their voices can be used for satnav devices. Do you think Adam West had the forethought to do something like that? Or, here's a wayout idea: What if they did some kind of Crisis on Two Earths story where Ward's Robin somehow teamed up with Kevin Conroy's Batman (from Batman: The Animated Series)? I heard something about this on the radio today and immediately thought of this thread. Who knows? In the future it may be possible to make animated (CGI?) movies recreating the casts of any classic movie or TV show. Amazing things are possible in the digital age, it's true. But Burt Ward has also seemed like he likes to sling it. 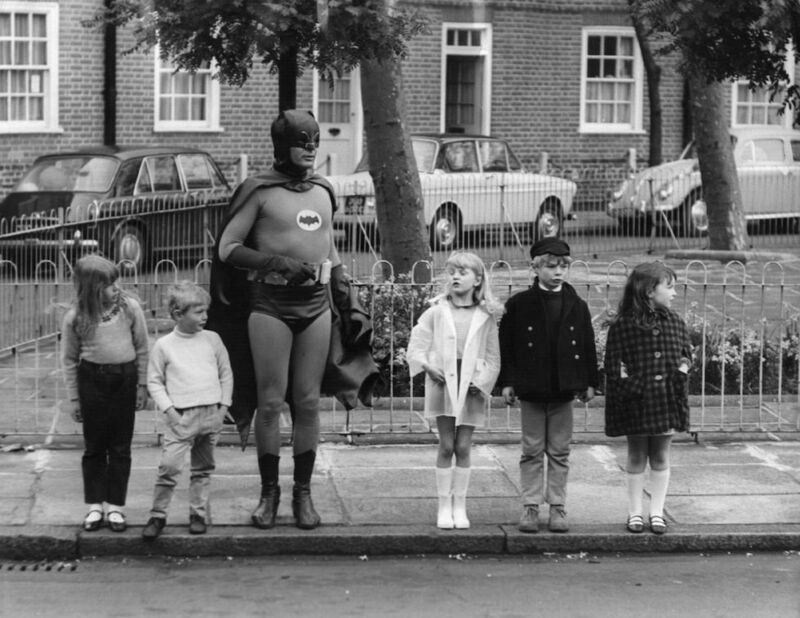 Lost footage of Adam West's Batman teaching kids Kerb Drill to be screened this weekend. I never understand why the more cars we have on our road, the less time we give to the Green Cross Code. Growing up we had all kinds of fun adverts teaching everyone how to cross a road and I can not recall the last time I actually saw an advert or anything like what we had. Obviously, this shows when you're out and about and you see people just wandering into the road without a care in the world. It almost feels like some people want to be hit so they can make a claim. When it comes to using a Zebra/Pedestrian Crossing, I always wait until the cars stop, never would I just walk out regardless of who is on the road. I see so many people who just walk straight across as soon as they arrive at one. That's very true. Those Green Cross Code adverts with Dave Prowse were a memorable part of my childhood. Not only were they informative, they always got my attention. We had some great public information films and ads back then. Some of them were bloody scary too. I'd love to see how they'd do them today. We had some great public information films and ads back then. Some of them were bloody scary too. I met Dave Prowse a couple of years ago. Peter Davison, Sarah Sutton, Julian Glover, Jeremy Bulloch, Chris Barrie, Danny John-Jules, Robert Llewelyn, Hattie Hayridge and Virginia Hey were also in attendance. As were a few people costumed as Batman and Darth Vader. Patrick Troughton used to voice some of the scary public information ads, where something nasty would happen. When it comes I see so many people who just walk straight across as soon as they arrive at one. Interesting, considering some of the drivers don’t stop. Here's one we had here in Australia back in the 70s.